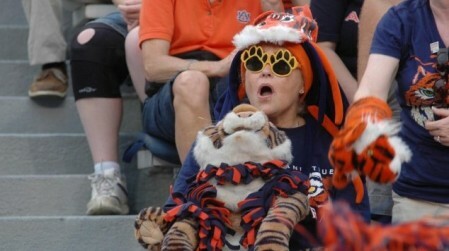 Amazing and Fun: a fan reacts to Guz Malzahn's Auburn offense. Photo by Kevin Strickland. 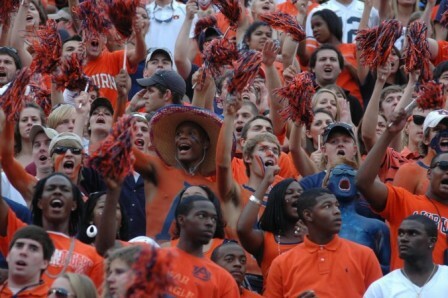 It’s been a long time since an Auburn game was fun. Really, really fun. Saturday night at Jordan-Hare Stadium was pretty-girls-smile-at-ugly-boys-because-they-can’t-help-it fun. It was Aubie-dancing-with-the-band fun. It was kiss-a-stranger-on-the-mouth fun. Auburn’s 49-24 win over Mississippi State was an offensive explosion the likes of which the Tigers have not seen in a long time. If by “a long time” you mean forever. In his first two games with the Tigers, offensive coordinator Gus Malzhan has helped shred the team’s offensive record books and sent the scoreboard pinwheeling. Auburn’s 49 points was the most since 2006; the 589 yards that earned them brings their two-game season total to 1,145, the most ever. 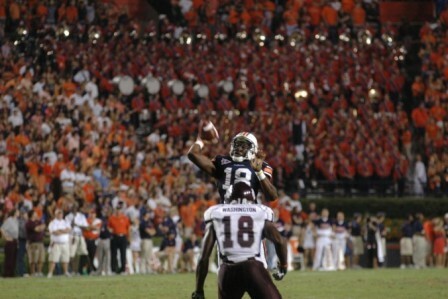 In 2008, Auburn didn’t break the 1,100-yard mark until its fourth game. Ben Tate and Onterrio McCalebb each topped 100 yards, both for the second straight game. Tate finished with 157 yards and didn’t play a single snap in the first quarter. McCalebb added 115 on 15 carries. That is the first time two backs have each topped 100 yards in consecutive games in school history. This coming at a program that once had James Brooks and Joe Cribbs in the same backfield, that once showcased Bo Jackson and Lionel James and later Jackson and Brent Fullwood. Both Tate and McCalebb averaged more than 7 yards per attempt. Tate finished 2008 with 664 yards, even after rushing for 117 in the season opener. The Tiger senior has racked up 272 already in 2009. Kodi Burns ran for three touchdowns and passed for another on a well-executed run fake that drew in the entire Mississippi State defense. Auburn put up 49 points — and should have had more — against a Mississippi State team traditionally known for its defense. Auburn scored more than 40 points only once in the last three seasons — a 55-20 win over New Mexico State in 2007. The combined total of 86 points through two games is the best since Auburn hung 63 on Ball State and followed that with 37 against Western Kentucky in 2005. To say that Malzhan’s offense has so far exceeded expectations is like saying Kate Beckinsale is sort of pretty. And it is providing the kind of fun that Auburn fans have dreamed about even when they were making all the right public noises about defenses winning championships. Face the facts: Auburn’s defense was stout enough to win the SEC and possibly more several times during Tommy Tuberville’s 10-year tenure. But only once, in 2004, was Tuberville’s offensive potential able to match the team’s defensive intensity. We all remember how much fun 2004 was. We all know it hasn’t been quite as much fun since. Former head coach Tommy Tuberville, despite a reputation as a riverboat gambler, grew increasingly conservative over the years. The 2009 edition of the Tigers under new head coach Gene Chizik seemingly has no such conservative bent. Case in point: Mississippi State blocked a second quarter punt to take a 17-14 lead with 4:44 remaining in the first half. In previous seasons, the Tigers might have been content to play it safe, run out the clock and plan for the second half. Auburn roared 80 yards in just five plays, burning a mere 1:36 off the clock to retake the lead. McCalebb covered the final 48 yards on a charge around left end. When the defense held Mississippi State to one first down on its ensuing possession, the Auburn coaching staff judiciously used its timeouts to preserve the clock. Auburn got the ball back at its own 22 with 1:29 remaining. Sit on the ball and protect the lead? No thanks. Todd hit Darvin Adams for 21 yards on 3rd and 8. After a 5-yard bullrush by Tate, Todd and Adams connected again for 28 yards. A 20-yard, Todd-to-Adams completion moved the ball to the Bulldog 1-yard line with 21 seconds left. From there Burns plunged in for one of his three touchdowns on the night. Instead of taking a 17-14 deficit and a basket of questions to the halftime locker room, the Tigers posted two scores in the final 4:44 and carried a truckload of confidence to the break. The Bulldogs were never a factor after that. Yes, it is only Louisiana Tech and Mississippi State. Tech may struggle this season as evidenced by the 32-7 thrashing administered by Navy on Saturday. Mississippi State may not win a single conference game and most observers peg the Bulldogs as the league’s worst team. But the Auburn of the last five years did not beat the Louisiana Techs and Mississippi States as thoroughly as this Auburn team did. Auburn won a lot of games over the last few years. The Tigers were perfect in 2004, posted nine wins in 2005, 11 in 2006 and nine more in 2007. But as much respect as Tuberville deserves, many of those wins just were not much fun. They were 23-17, 22-15, 17-3 type games. They were gut-wrenching, edge of your seat, heart-stopping roller coaster rides. But they were not this kind of fun. 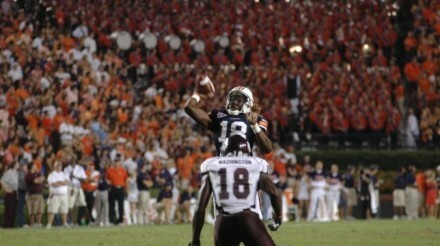 Take the 2006 Auburn win over LSU. When the Bengal Tiger’s last desperation pass fell short and Auburn held on to a slim 7-3 win, the ground literally shook with the roar of the crowd. Players and fans were in tears, hearts pounding in their throats. It was a tremendous moment in Auburn history, but it was an agonizing kind of fun. Games like that are fun in the same way going to see “Halloween XXXIV: Astronaut Michael” is fun. You scream. You are afraid to look. You laugh in nervous relief when it is finally over. And you look in your backseat to make sure there is not some boogey man hiding under a blanket. Saturday night’s demolition of Mississippi State was more like going to see “Rocky MMLCIV: Balboa Unleashed.” You go in hoping the guy can pull it off and not only does he make it through the fight, he clobbers the opposition. You cheer. You laugh. You cry. And you leave the theater with a strut in your step, ready to take on the world. Saturday night was that kind of fun. Tiger fans cannot wait for the sequel. It’s too early to begin building the Gene Chizik pedestal. It’s not time to start minting the Gene Chizik coins. Unless you live in Iowa where that was already done, that is. But it is time to recognize that if nothing else, Chizik and his staff have found a way to make Auburn football fun again. Now it is time to see if they can make the Tigers relevant. The road to relevance starts with 2-0 West Virginia on Saturday. In addition to writing and taking photos for The War Eagle Reader, Kevin Strickland serves as the sports editor for the Pickens County Herald , a weekly newspaper in West Alabama where he has covered high school and college sports for the past 15 years. In his career as a sportswriter, he has covered 12 state championship teams; followed the careers of three local football players who starred at college and played in the NFL and covered two local baseball players who played in the majors. He has won numerous Alabama Press Association writing awards including being named the state’s Best Sports Column in 2004. You’re 100% right about a different kind of fun. Growing up, Auburn football has mostly been about defense-first nail-biters. The prospect of some blow-the-doors-off scoring-fests is certainly intriguing.